Today is Day +100 since my stem cell transplant. Fortunately for me, I have tolerated it fairly well with minimal issues. One issue I did have was I contracted conjunctivitis (pink eye). I was letting my guard down too much and put myself at risk by being in crowded areas, not wearing my mask, etc. Lesson learned. With that said, I saw having pink-eye as a good sign that the HSCT procedure was working. I had not been sick in years because my immune system was in over-drive, and it appears that now it's not. 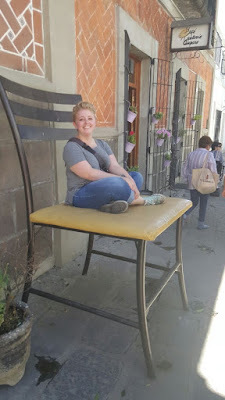 I was looking back on my last post from May 10 and thought I'd update where I am now compared to then. July 10 - It's back. I will just be sitting and all of a sudden my face/neck will turn bright red and I have to get to a fan or in a cold shower fairly quickly. I can't be outdoors very long. This is disappointing. July 10 - Some improvement. I'm able to take the dogs for a short walk SOMETIMES without feeling my legs getting heavy... but then sometimes they still do get heavy and slow. July 10 - Seems the same. I am still feeling the tingling/numbness mostly in my hands but not all the time. July 10 - I'm not seeing much improvement over May 10 which is tough for me. If I focus hard on anything, I get brain fog pretty bad. It feels like my brain is heavy and it's hard to explain, but it feels like swimming motions in my head. Since I'm not working, I decided to start drawing again to keep myself entertained. Even this activity caused brain fog issues. While I'm seeing some slippage in areas, I'm still not discouraged. Previously, one of the biggest clues that I was on the decline, was the inflammation in my eyes would come on strong causing me to start losing my vision FAST. I used to have to take Azathioprine (Imuran) daily to keep the eye inflammation down. Today I am not on ANY drugs whatsoever and my vision is as good as it can be. I have quite a bit of scar tissue in my eyes, so it will never be perfect. 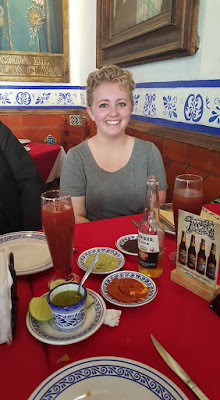 I went back to Mexico in June to receive my Rituximab infusion. I tried to get it done here in the states, but my insurance denied and it would've cost between 12 to 14 thousand per infusion. In total I need 6 infusions. 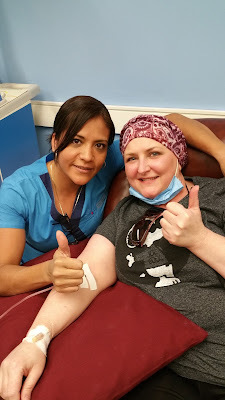 So, we packed up and went back to Mexico to receive my 2nd infusion. The first was given at the end of my HSCT treatment. 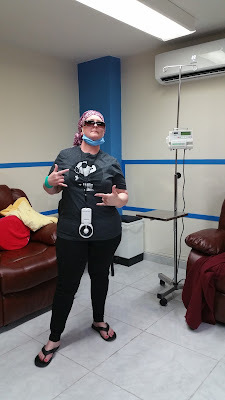 From there, I brought the Rituximab and the Hydrocortisone for the next 4 doses back with me as I have found a nurse that is willing to give me the infusions at my home. One thing that was causing me a lot of stress was the fact that you have to have a medical license to buy Saline solution in the US. I had no idea! I am shocked you need a license to buy salt water.. unbelievable. My suggestion for anyone bringing back the drugs to the states to do the infusions themselves, get Clinica Ruiz to include the Saline and write it on the prescription documents to avoid running into issues. My local neurologist, Dr. Kosa, whom I love, is really pushing me to go to see Dr. Bowen, a MS specialist in Seattle. 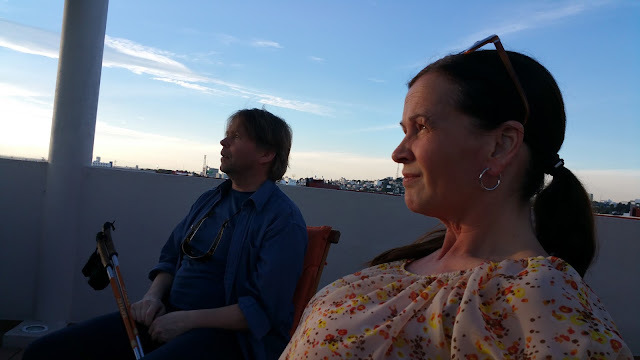 I was confused by the push to see this other doctor, but Dr. Kosa stated that he thought I should come up with a back up plan in case the HSCT procedure does not work. 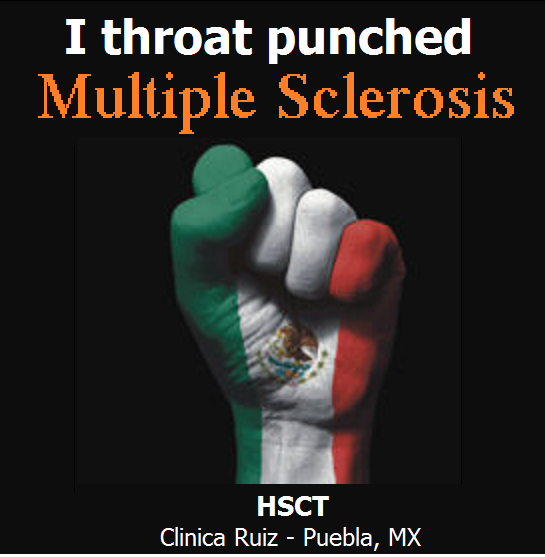 He said that he was very impressed with Dr. Bowen, who was involved in some of the original HSCT trials years ago and apparently travels all over the country talking about the newest MS procedures/drugs/possibilities. Dr. Kosa said he had talked to Dr. Bowen about me and that he was very familiar with the Clinica Ruiz protocol. I'm fairly impressed that my neurologist has NO EGO issues whatsoever and is really looking out for my best interest. 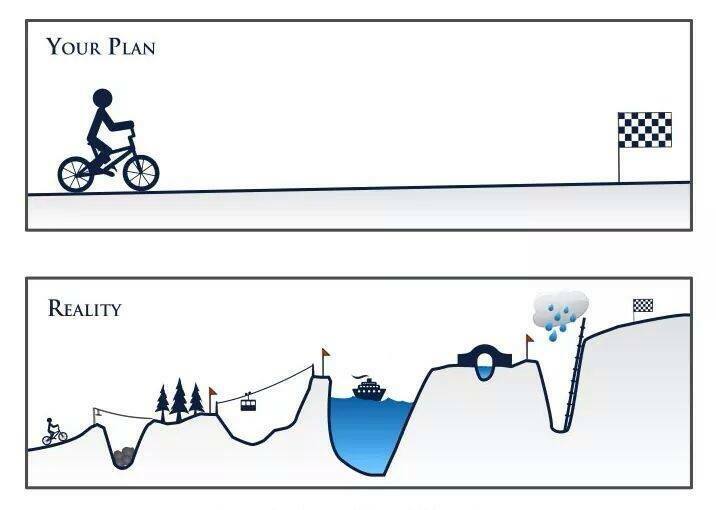 I have an appointment in mid August in Seattle and will update everyone with "the plan". 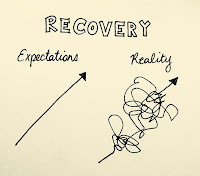 George Goss has a great image to help people understand what the HSCT recovery period is like. His image is actually better than what I have here, but I couldn't find it. 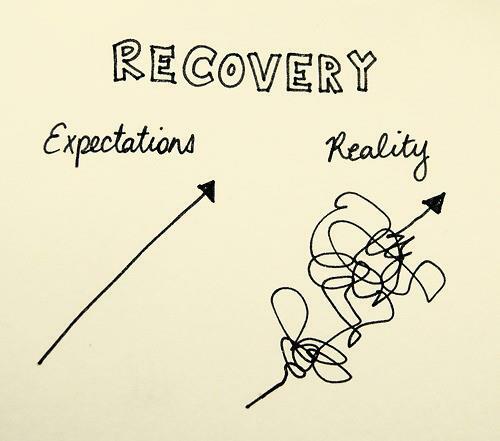 The concept is the same - you have ups and downs through the journey, but be patient. 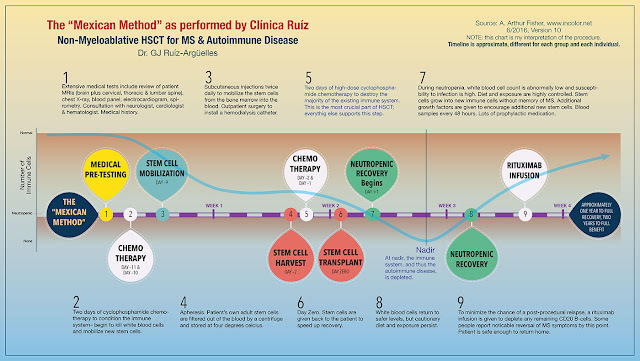 I need to always remember that my recovery will take up to 2 years and that the goal of HSCT is to STOP the disease. Any added improvements are a BONUS!! Well, it's been 30 days since my HSCT stemmie birthday. Overall, I'm feeling pretty good. Vision is much better. About 2 weeks before HSCT procedure, I was quickly losing my vision again. I went to the neurologist and he put me on steroids but asked me to see my retina specialist. My retina specialist indeed found inflammation in both of my eyes again. He felt I'd be okay on the steroids prescribed by the neurologist until I had the procedure. Fatigue is better (most of the time). I've noticed that I'm staying up much later than before. I feel like I used to be in bed by around 9 PM (at the latest), and now I'm up to 11 or so. Heat Intolerance - this has gone away. If anything, I seem to be cold now. I used to need a fan blowing on me at all times. I seem to feel better in general. I do not think I'm seeing any improvement in walking yet. For me, I start out each day pretty good, but as the day wears on (or when I've been walking more than normal), I can feel that dreaded heaviness in my legs. On my bad days, I really start slowing down and my legs start crossing when I walk or I get foot drag (or both). All that is still there. I went to see my son at his ballgame and from the ball field to the parking lot, my walking deteriorated so much I could barely walk. My left foot was dragging and I was very slow. It was probably the worst it has ever been. 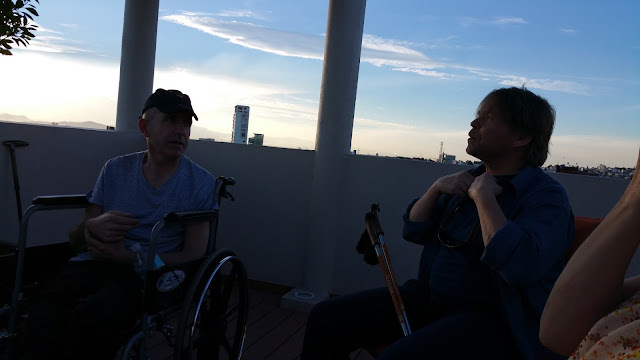 I guess the good part about this problem is that there is no pain and that after I rest for quite a while, I seem to get full mobility back (at least for a while). My brain fog comes and goes. I helped my daughter study for her college exam and the whole next day I seemed to have issues with brain fog. 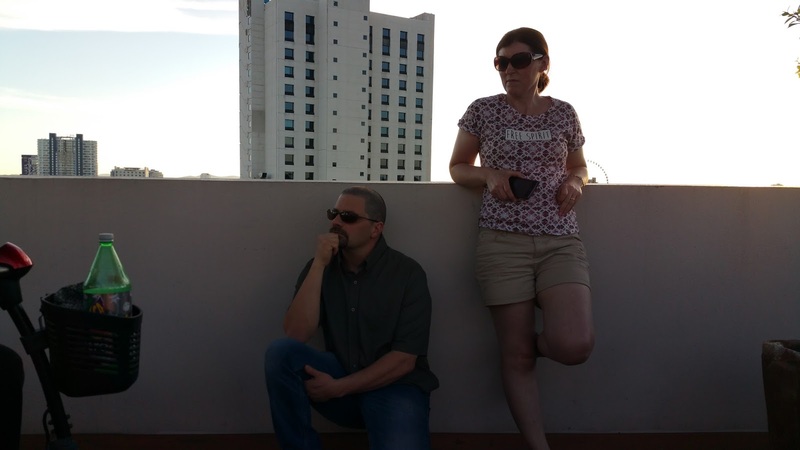 As before HSCT, the more I work my brain, the more issues I have with the fogginess. When I have a day of not using it much, I seem to be okay. Hoping that will clear up because it's quite frightening for me and I need to use my brain and keep sharp. I still seem to have urinary frequency and urgency, but it is manageable (as long as I'm close to a restroom). Numbness/tingling in hands and feet. This may be a little better, but I'm still noticing it, especially in my hands. I know this is a process and I may not see the full benefits for up to 2 years, so I'm not discouraged at all. I just want to keep track of where things are and share it across with anyone that's interested. My hair didn't fall out like I expected. I had shaved my head, but as the stubble has grown back, I keep waiting for it to fall out. That's not happening. I THINK I see two spots that look thinner/patchy - but not bad. I am seeing a lot more gray coming in now than when Scott shaved it. 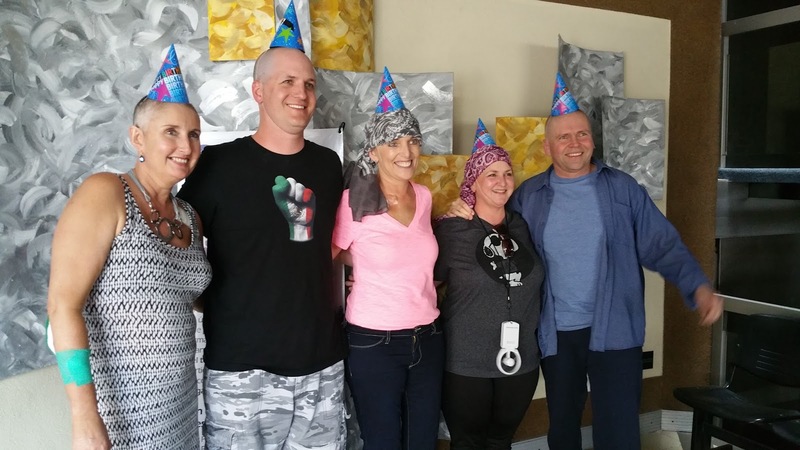 We probably shouldn't have shaved my head, but was told that at such a high dosage of chemo, it was guaranteed to fall out. ...Hmmmm... I wonder if it's still possible that I will lose it after a month? Thoughts? Maybe some people with chemo experience or health professionals can give their feedback in the comments section. I'm staying inside for the most part. I'm taking this very seriously and doing everything I can not to jeopardize my health. When I do go out, I wear my mask and take my hand sanitizer with me. With that said - I'm pretty bored but that's okay. I'll take it. Scott is back to work and I think he's happy about that. He too was pretty bored spending all that time inside not doing anything. We came home to some major plumbing issues and I know he's already tired of dealing with that!!! Poor guy. There doesn't seem to be a break for him. One positive, his back seems to be much better. 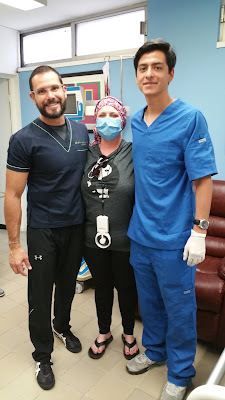 We were pretty worried as while we were in Mexico he was having a lot of pain still from his back surgery, but it lightened up and he's doing much better. I saw this poem on Google images and thought I'd share. 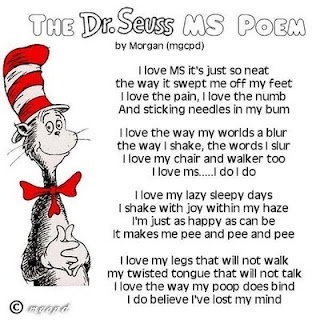 I found this to be a true statement for some of my issues that come and go and felt it may help some people understand MS in a humorous way. The original blog has been removed, so I don't how to give the appropriate credit or ask permission to re-post. So Morgan, if you read this, and have issues with me posting, just let me know and I'll remove. 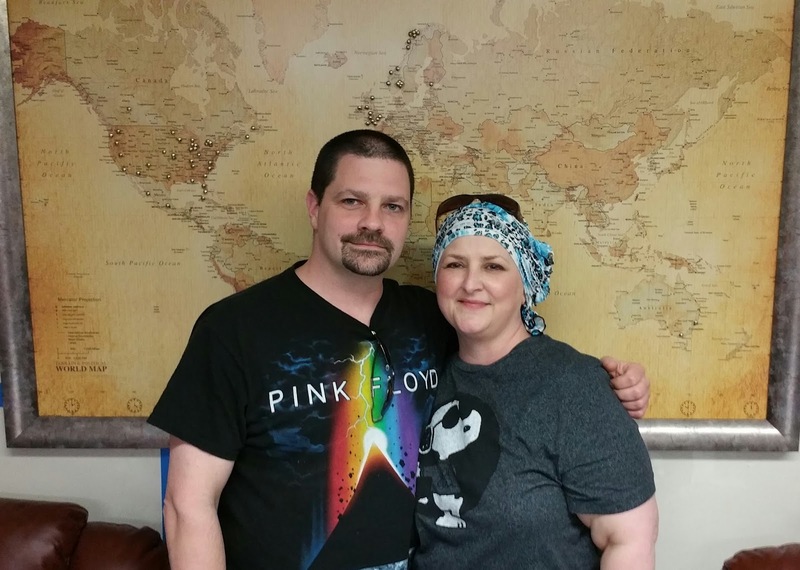 Scott & I after placing our pin in the HSCT world map. We're Done!! 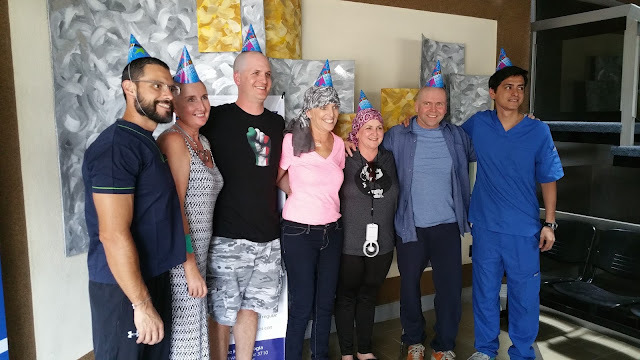 Yesterday (Day 10) - part of the group went through the final stage of the transplant. We received our Rituximab (Rituxan) IV. Clinica Ruiz uses Rituximab as a booster to the chemo previously given. 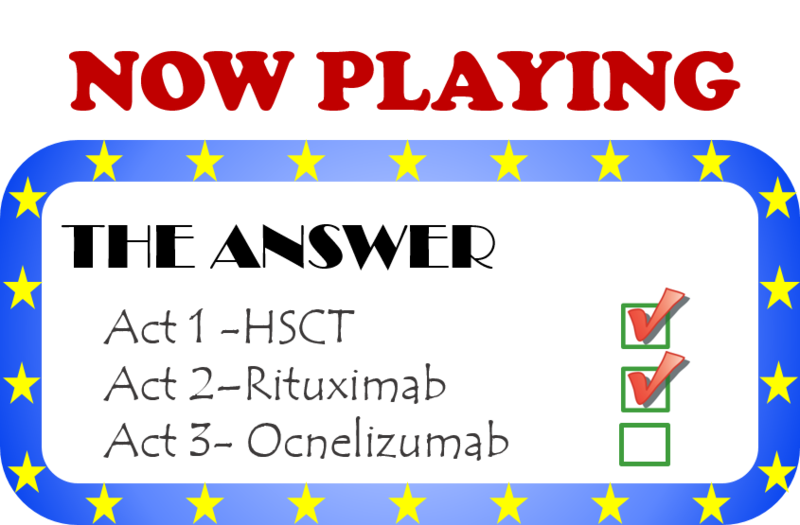 Rituximab is a monoclonal antibody. 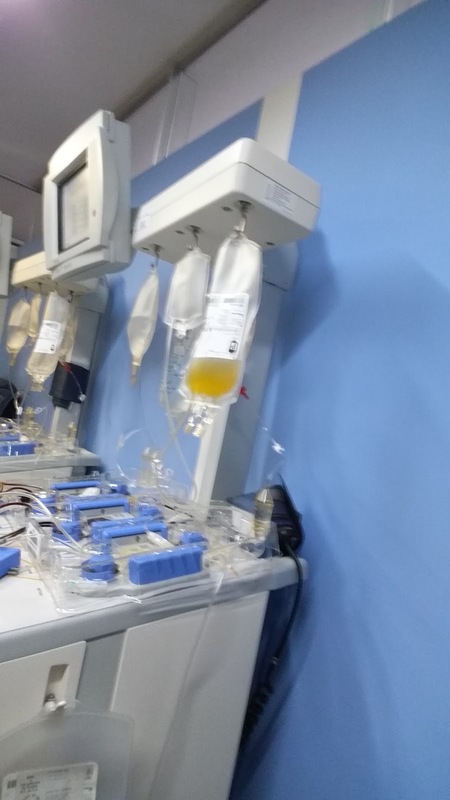 It has been used to treat certain types of blood cancer (leukaemia and lymphomas) for several years. 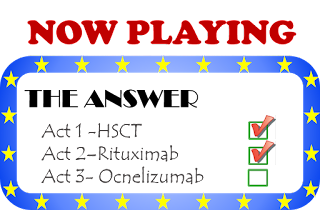 Rituximab works by targeting a certain type of immune cell known as a B cell. B cells are thought to contribute to myelin damage in MS, by reducing the number of B cells rituximab may reduce myelin damage in MS. So, in a nutshell, the thought is that any nasty mature B cells not caught by the chemo will be handled with these booster infusions. I will have 5 more infusions every other month for the year. For me, and some others, there was some reactions to the drug. My throat felt like it was starting to swell and close up. My neck, throat, and head were very itchy and I also felt very congested which brought on coughing and sneezing. The injected Cortisone into my IV, which helped a lot, but still felt the congestion for most of the day. I became very sleepy and slept through a bit of the 3 hour infusion. Once we got home, I tried to attend a small get together, but wasn't feeling well, so came to the apartment and slept and slept and slept. I feel better this morning, but still not great. I noticed some tingling in my hands which I hadn't felt for more than a week and I have a killer headache, so just a little off. As far as Clinica Ruiz is concerned, we are done here. We leave to come home on 4/23 and I can't wait. I'm very homesick and extremely bored. I have a packet of info to give to my local neurologist and will follow up with next steps in the States. Not a ton to report. I did have an issue with my blood pressure on day +1. That whole day I felt off, and Scott decided to check my blood pressure, which was too low. Throughout the day, it just kept dropping. He ended up calling the doctor when it hit 91/46. The doctors were quick and thought I was probably dehydrated. I felt I had been drinking enough water, but definitely not the 3L I was supposed to drink. So I got out of bed and drank 2 liters of water within about 45 minutes. The doctor was right - my blood pressure started to rise. I was happy, because the next step would've been hospitalization which none of us wanted. At midnight, Paco was knocking at the door to deliver Electrolyte drinks. I am still impressed at the service and attention we are receiving here. Since then, I've been drinking soooo much water to make sure it doesn't happen again, and the lowest it's gotten down to since is 99/55. While that is still low, it's not too bad and I'm keeping an eye on it. I go back to the clinic today to get my every other day consultation from my blood work. I'm a bit concerned. I do not feel my WBC count is low enough and I haven't hit the neutropenic stage. Actually, my WBC count was up 2 days ago from the previous measure. I think I just need more education here. I had thought that the goal, was to pretty much eradicate those numbers. I will talk to the doctor more today if they are still so high. Today's Post Consultation Update: WBC dropped from 13000 to 2300, so I am feeling much better. The process is working. It's just taking me a little longer than some others. Dr. Ruiz said I was definitely going Neutropenic and expected my levels to drop some more. He said I need to keep taking the Filgrastrim shots to keep stabilized. It's fun to watch the senior Dr. Ruiz at work. He is definitely the godfather of the team. His staff hangs on to every word and seems to follow him around, listening and learning. Love it!! Oh - Scott & I designed my new FB profile picture. I think we're going to get t-shirts made too. What do you think? Today is my new birthday. 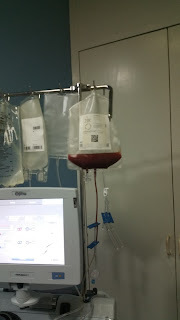 My stem cell transplant happened today around 2:00 to 2:30. My total stem cell count was 151 Million (46 from round 1 and 105 from round 2). They wanted me to have at least 75 million, so I way exceeded that number. I feel really good today. I think it may be a bit of an adrenaline kick knowing that today is the day. Below are some photos we took to celebrate the day. I haven't updated the blog for the past few days really because there wasn't much to update. We have been receiving our Filgrastim shots twice per day to stimulate stem cell production. I've been waking up with some pretty intense headaches and seem to have nausea on and off, but overall, this is not bad at all. Lauren went home on Saturday morning. 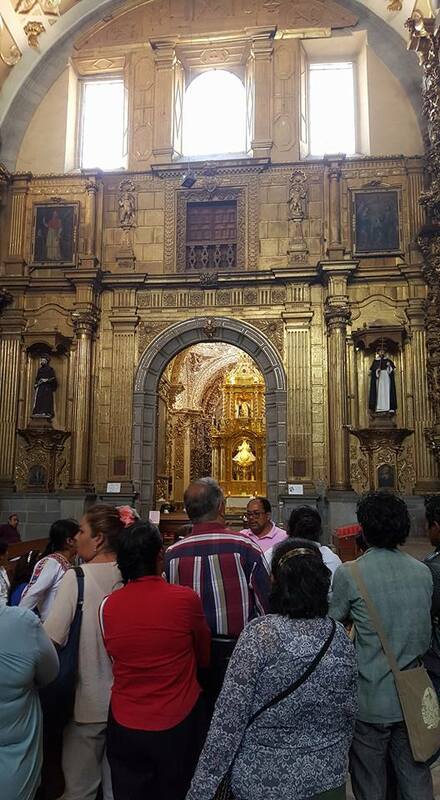 On Friday, she went with some of the team to see parts of Puebla (pictures below). Looks like she had fun. 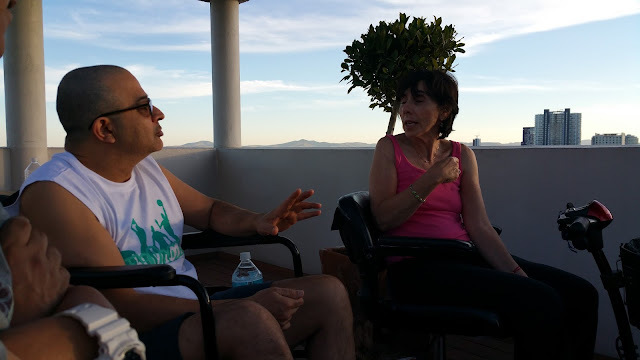 Thanks to Fanny, Shlomo, Chris and Patti for letting her tag along. I wasn't feeling well, so Scott & I stayed in. 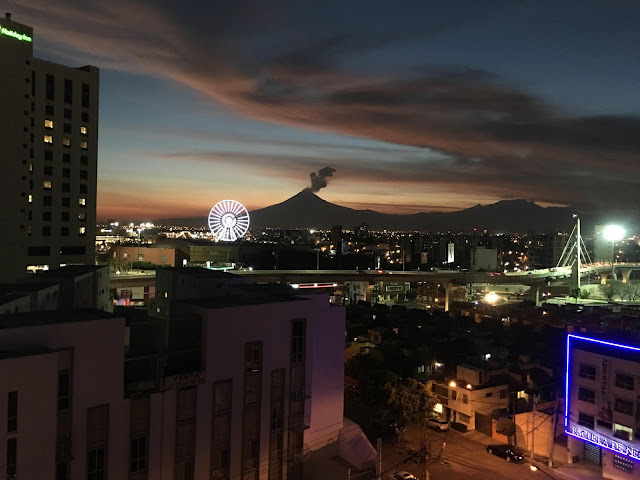 Saturday - Most of group 2 went to the rooftop of the apartments where we have a fantastic view of the volcano Popocatepetl. Some of Bill's friends live in Mexico and came by to say hi to everyone and we were even entertained by David who played the hang drum for us. All in all, it was a very nice time with my new friends. Bhakti took some exquisite photos of Popo that she has generously said I could re-post. Drug update for yesterday and the next few days. Filgrastim: A granulocyte colony-stimulating factor analog used to stimulate the proliferation and differentiation of granulocytes; it is a pharmaceutical analog of naturally occurring G-CSF. It is produced by recombinant DNA technology. Dexamethasone: A type of steroid medication. Itraconazole: A triazole antifungal agent prescribed to patients with fungal infections. Trimetoprim/Sulfametoxazol: An antibiotic used mainly in the treatment of bladder infections. 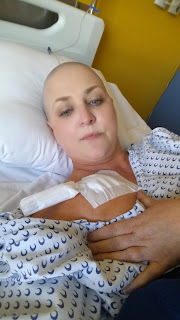 Tomorrow I will get the catheter placed in my neck in order to prep for the apheresis (cell harvesting). Not looking forward to that, but apparently it will be under local anesthesia which is good. Well, that's about it. I'll probably update after my catheter placement. We'll see how it goes. Not too much to report for today. Over the next several days, I will be receiving injections of Filgrastim which stimulates the production of stem cells in my bone marrow. I feel a bit nauseous and have been battling a pretty good headache but all is good and manageable at this point. 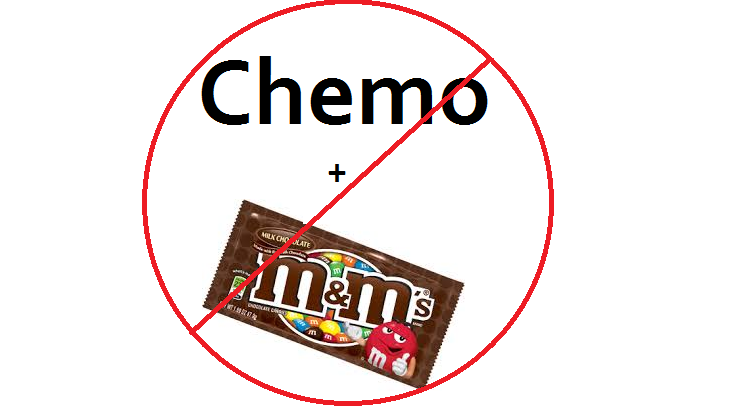 Day -6 will have an extra 3 medications, but I'll update later for those. 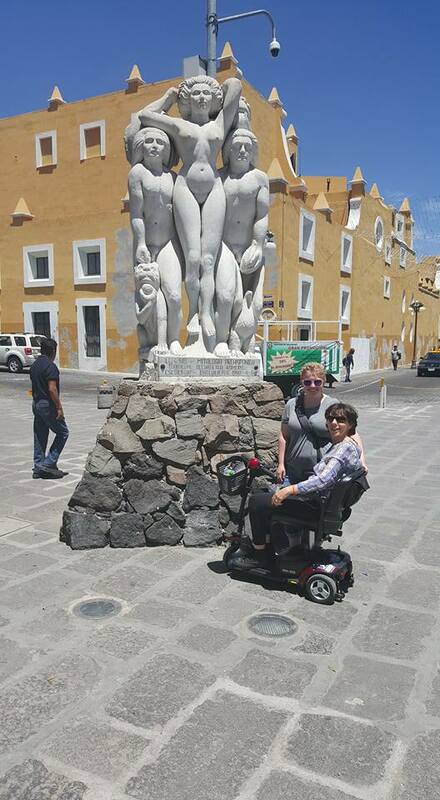 Lauren will be going out with some of the group tomorrow to do some site seeing here in Puebla. I will probably stay in as I am uncertain how things will progress for me tomorrow. I hope the team has a great time. Be sure to post any questions you may have.